A special thank you for people like you! Chesapeake Feline Association is so proud of all the community support we recieve. There are times when some people go above and beyond, and we would like to dedicate this page for everyone who does. We can never begin thank you enough for all of the time spent to help and support us! Chesapeake Feline Association would like to give a big meow to Elise. Elise has been helping care for the cats living at our shelter! The cats love to see her when she comes in. She takes the time to pet, play with, talk to, and love on each of them. She has helped many shy cats come out of their shell, eventually leading to their adoption! Elise and her family are also part of the CFA Foster team, where they have helped many shy and timid cats become more comfortable and adoptable! Thank you Elise for all the hard work and dedication! 2 paws up! Chesapeake Feline Association would like to give a big THANK YOU to the students at Emmorton Elementary School! They made signs, toys, and lots of goodies for our cats and kittens. These students took time our of their day to stop and think about our lovely cats and kittens! We, and the cats, are forever grateful for what these students have done! 2 paws up from everyone at CFA, you guys rock! 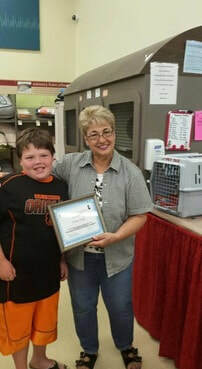 Chesapeake Feline Association would like to give a special shout out to one of our dedicated volunteers, Robbie! Robbie loves to visit the shelter and help take care our cats. As you can see, the cats love Robbie! 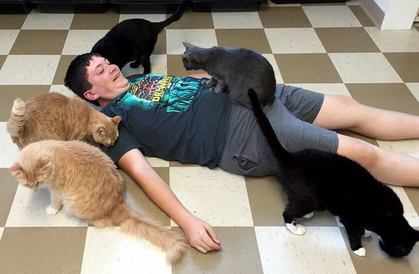 Thank you Robbie for being such a wonderful volunteer for CFA and great friend for all the kitties! 2 paws up! 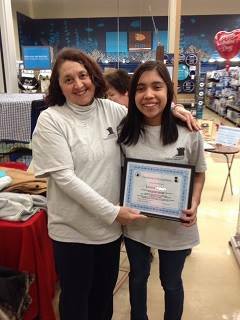 Chesapeake Feline Association would like to give a big thank you to our volunteer, Kali! Kali comes out and cleans at our shelter, and the cats love her! She even takes more time out of her day to socialize with all the cats, thank you for your help and dedication Kali! We love all of our younger volunteers taking steps to help out and support us! Chesapeake Feline Association would like to give a special thank you to Chase! This young man has been a big help with volunteering and spending time with the shelter cats! Instead of birthday gifts, Chase asked friends and family to donate to CFA! Chase, you ARE the cats meow! We would like to share with you one of most dedicated young volunteers. Leena is such a hard working volunteer for CFA. She has visited many times to help clean, take care of, and love our cats at Petco! She has always helped whenever needed. Leena has gone door to door in her neighborhood to collect blankets, pillows and other items from the CFA wish list. Leena your dedication to CFA, our cats, and kittens has gone above and behind the call of duty. You are truly a Super Star in our eyes! Thank you Leena from the bottom of our hearts and paws to the tip of our whiskers! 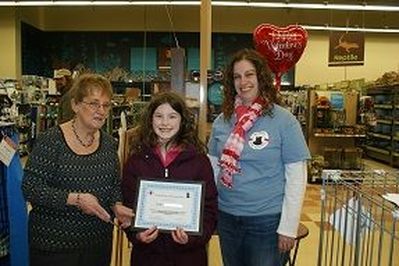 Chesapeake Feline Association would like to take a moment and honor a wonderful young lady named Sam. For her birthday, she asked her friends and family to donate to CFA's cats and kittens! These donations mean the world to us! Our cats and kittens would like to say..thank you for all you do!! 2 paws up!